The Chariot Tarot Card symbolizes your conflicts ending in victory. On revealing of The Chariot you can be fairly sure that with sustained efforts if in a current struggle or facing one, that you will win. This card also foresees unexpected good news and represents self reliance and belief in your personal abilities. Travel and change is often indicated by The Chariot Tarot Card as well as representing a vehicle. If the card is in a favorable position it could possibly mean you are going to get that car you’ve been pursuing. It can also mean that a current problem with a vehicle of yours will soon be resolved. Negatively The Chariot can mean that either you or someone of influence around you is being arrogant and selfish and a bully. Another negative aspect is that it can represent frustrations and delays with plans regarding travel or vacations. Be vigilant when making travel plans when you see this card in a negative aspect. The Chariot Tarot Card is the seventh Major Arcana card in a tarot deck. As a Major Arcana card, the purpose of this card is to give people ideas on what their lives are like and what they can expect out of their lives well into the future. The information that may be used in such a tarot card can help to give people ideas on what they can learn about in their futures. The Chariot Tarot is symbolic of control and determination as well as aggression. The information that is covered in this card can really be important for all to analyze and understand when it comes to seeing just what one can expect out of life and how to try and run it. 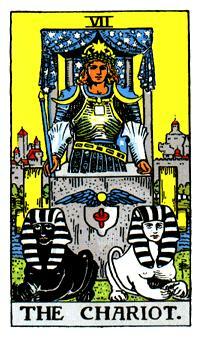 This card features a design where a person appears to be commanding a chariot. This is often associated with the Cancer symbol. The chariot commander is on a canopy that features six pointed stars. These stars are reflective of his influences and how he is using them to impact the lives of others in some way. There are also two crescent moons on his shoulders. These are symbolic of the world around us. Meanwhile, the symbols on the front of his outfit is reflective to how man is able to transform his attitudes and beliefs in a number of different ways. Part of this is reflective of the will that humans hold. In addition, the star crown that he wears is symbolic of the way how the human spirit is able to evolve and mature over an extended period of time. Like many other cards, this appearance is reflective of some kind of religious meaning. This can be found on the wings featured on the chariot. The wings show symbols relating to the mixing of positive and negative attitudes as featured in the Hindu faith. These attitudes can be seen through the mixing of the two sphinx figures. There are two of these sphinxes; one of them is perfect white while the other is black. The forward-moving nature of the charioteer also suggests that the man in the Chariot Tarot card is willing to move forward. That is, he is willing to leave behind the material and physical things that he sees in life in favor of the spiritual values that he might hold. This is often a tough decision for some people to make but it can really make a difference in the lives of many people. The big point about this card is that it can often be reflective of the ways how the human mind is going to respond in some way. This is, if often entails the need to respond to certain events and to understand where one wants to go in life in order to become a more successful, mature or knowing person who is one with the world at large. The Chariot Tarot card can be found right after the Lovers Tarot card. This is symbolic in that it shows that there is a need for a person to get away from the impulse that was establish as it brought a person into the garden. The person will board the chariot and leave. In particular, it is similar in some way to the story of Helios, a Greek god who rides a chariot around the sun as a means of bringing light out to the world. This means that there is some kind of bright feeling that will move out into the world at large. The Chariot Tarot card, like many other Major Arcana cards, takes a look at the way how behaviours that one needs to follow can be impacted. It is symbolic of the attitude that a person holds with regards to the direction one wants to head into well into the future. It may particularly be indicative of whether or not a person is truly ready to move forward in life and to understand what needs to be done in order to actually go places in the world at large. The behaviors that are created might vary based on the attitudes that one holds. However, the Chariot Tarot card is one that is going to really make a good consideration that needs to be explored in some positive manner in order to really go somewhere in life. If the Chariot Tarot card is upright then it means that the a person has confidence or is going to find the confidence that is needed in order to go far in the world and to eventually reach enlightenment. It can especially be reflective of the willpower that one has and if the willpower in particular is going to be rather productive and supportive of the needs that one may hold in some form. It also means that a person needs to make some changes in life in order to get far. This includes the need to develop discipline and to prepare for hard work in order to make it somewhere. This might require plenty of effort but the Chariot Tarot card knows that if the right forms of work and effort are used, a person can get anywhere in the world and really become a figure that is not only imposing on others but also rather influential in some way. It also symbolizes the need to be assertive. That is, this means that the person is to be more active and productive in terms of finding ways to fix one’s life and to improve one’s status in the long run. This can really be indicative of the ways how one is going to change and behave as necessary. Simply put, a person who receives this card as it is upright will be someone who is either assertive or will have to use an assertive form of behaviour in order to go far in the world. A completely different meaning will be found in the case when the Chariot Tarot is reversed. This means that it is upside down and it appears that the charioteer does not have much guidance over getting the chariot to move forward. If the card is reversed then it means that the person is suffering from a lack of control over one’s life. It is as though that person is unaware of the direction that one is supposed to head into, thus making it harder for that person to actually get some place and move forward within one’s life. In some cases the card will suggest in its reversed position that one is not all that comfortable around others and that the person is stuck upon the mercy of others. That is, the person is unable to take control and is only going to be willing to listen to whatever it is someone else wants to say without much help. It makes it to the point where a person might feel as though there is no direction in one’s life and that different changes have to be used as a means of getting into a different position in one’s life. This is a problem that can really be a hassle to some but it is something that does not necessarily have to stick around for far too long. A person can use this reading to realize that there is a crucial need for that person to take action. While the person at a given time might not have much control, it will never be too late for one to actually make a change and adjust one’s life in a positive and sensible way. In some cases this might also suggest that a person who is in control of things in one’s life now and is rather assertive might end up losing one’s control over time. That is, the person may end up stopping to feel controlled and managed in some way and is going to become far too difficult to work with in some way. Specifically, many people who draw this card when reversed are going to feel as though they are worried about losing control. This does not mean that it is going to be all that hard for many people to bear with. It might help people to understand that there is a way for them to prepare themselves in the future and will understand that there’s a need to take a careful look at what can be done in order to keep the effects of such a problem from being any worse than what it might already be like. The Chariot Tarot card is one that is symbolic of the direction that a person wants to go and whether or not that person is prepared for these things in some way. It can help people to understand what it is that they are trying to do in life and whether or not they have some kind of control over their lives. It is a card that truly needs to be analyzed when it comes to finding something that you know will be sensible for the goals that one might hold.